(From Sony lens literature) Sony has introduced the world’s first 35mm full-frame lens with power zoom 1, the new FE PZ 28-135mm F4 G OSS (SELP28135G) model for its E-mount camera line. Designed for serious film makers, the new lens is an ideal match for Sony’s α7S full frame camera, capturing immense amounts of detail while shooting Full HD and 4K video. The new power zoom lens features Sony’s new ‘Smooth Motion Optics’ design, which addresses three issues of prime concern to movie-makers: change in angle of view (‘breathing’) while focusing, focus shifts during zoom and movement of the optical axis during zoom. Additionally, the FE PZ 28-135mm F4 G OSS has three separate control rings for focus, zoom and aperture for a satisfyingly responsive, professional feel. Lens zoom is exceptionally smooth and silent – a must for professional movie production – and is powered by the SSM drive, an industry first for interchangeable lens cameras1. Zooming speed can be precisely controlled over a wide range, with the ability to switch zoom rotation direction as desired to suit personal preference. The lens also features a responsive “double linear motor” that helps to minimize focus noise and to achieve accurate and responsive focus control. Users also have the ability to switch from auto to manual focus simply by sliding the focus ring. The FE PZ 28-135mm F4 G OSS has a constant F4 maximum aperture, allowing for beautiful depth of field effects and stable exposure control across the entire zoom range. It is built with aspherical elements that work to suppress unwanted aberration, and comes equipped with advanced multi-coating technology that boosts contrast and cuts glare, even with strongly backlit scenes. The FE PZ 28-135mm F4 G OSS model is compatible with all Sony E-mount cameras and camcorders, and when paired with bodies that have an APS-C sensor like the α6000/α5100/NEX-EA50M cameras or a Super 35mm sensor like the NEX-FS700 / PXW-FS7 models, its focal length extends to 42-202.5mm (35mm equivalent) range. And weighing just 2 lbs 11 oz, it’s a great option for long form “run and gun” documentary shooting. The versatile new SELP28135G also features Optical SteadyShot™ image stabilization and is dust and moisture resistant, allowing it to perform well in tough shooting environments. 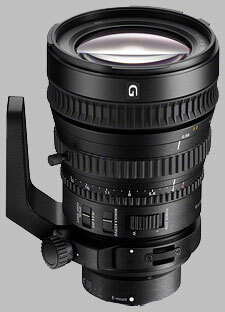 The FE PZ 28-135mm F4 G OSS (SELP28135G) full-frame power zoom lens will be available this winter (2014-2015) for about US$2500 at Sony retail stores (www.store.sony.com) and other authorized dealers nationwide. 1 As of September 12, 2014, according to a Sony survey. Survey covers all interchangeable lenses for digital cameras. The Sony FE 28-135mm f/4 G OSS PZ SELP28135G doesn't have any user reviews yet!